April Art’s new 12-song collection is a sonic demonstration of alt-rock music muscle and authority. 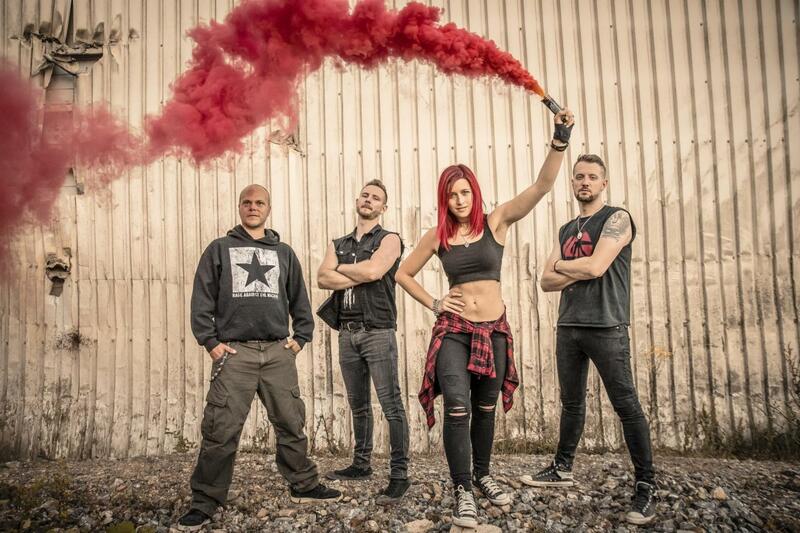 Fronted by a superheroine of sound, complete with matching cartoon characters, the Giessen, Germany-based band cranks out original cuts which have a distinct direction. Radio friendly and fueled with intense fervor, the album succeeds in blasting through the usual rock and pop listening territories before reaching higher ground. Here is how. Available Apr. 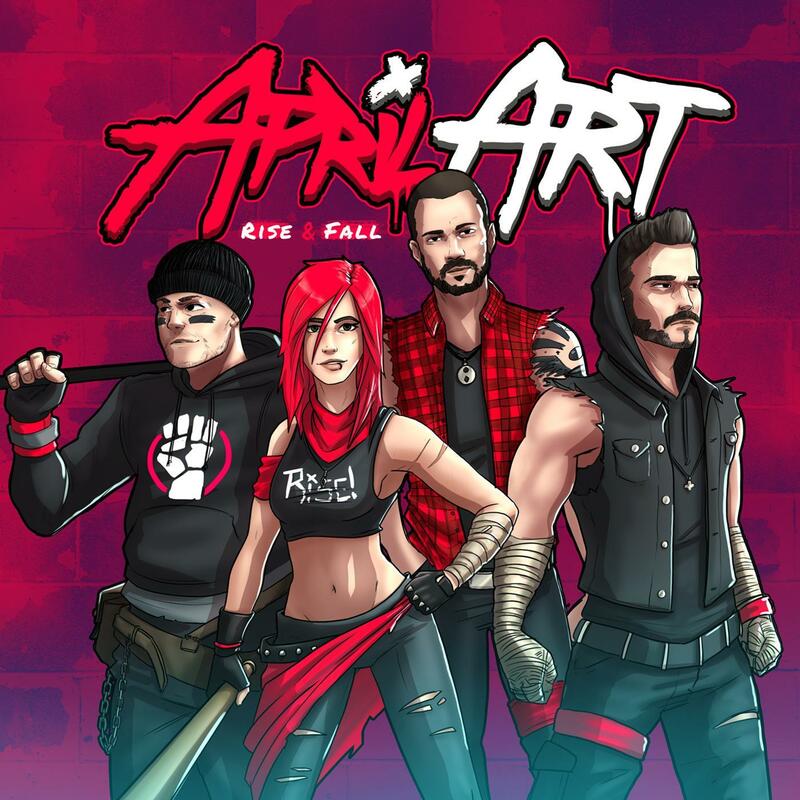 26, the title alone, Rise & Fall, is a reflection of how April Art enjoys going against the grain. 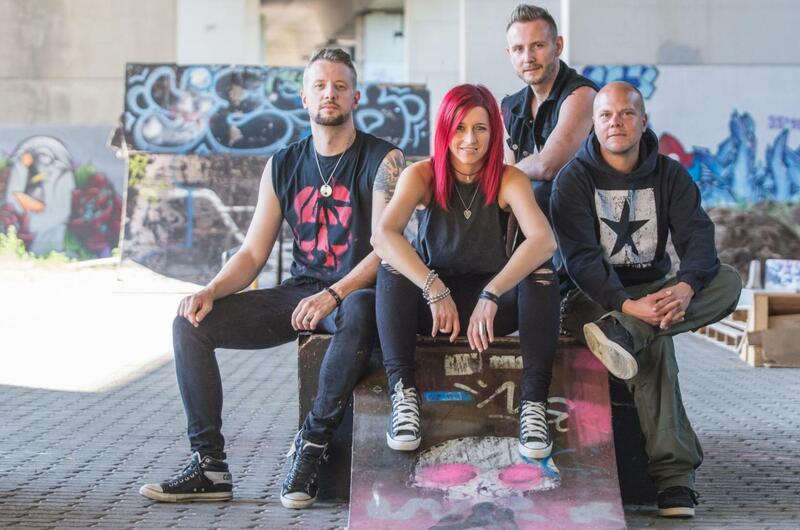 April Art is Lisa-Marie Watz – vocals; Chris Bunnell – guitar; Nico Neufeld – bass; and Ben Juelg – drums. Together, the band cranks without a miss, beginning with the 4:30 title cut, which opens the album. The group wastes no time getting down to business. Forget any long drawn out intro, because April Art is already stoked at ten seconds into the song. Guitar driven, an amped solo riff cycles twice before Watz’s vocals kick in and the full melody takes hold. The bass and drum battery is close-fitting, providing superior framework. Watz’s “rise and fall” refrain has an anthemically inclusive ring. The second track, “Not Fair,” released in 2018 as the lead single from Rise & Fall, is a contemporary alt-rock melody roaring with intensity. The sound of “Not Fair” is big and can move a lot of air around larger stereo speakers. Bunnell’s passionate attack includes both chording and picking on a solid body, as Neufeld and Juelg maintain a tight pulse. Of course, vocals and lyrics play an important part in the overall April Art plan. “It’s not fair, it’s not fair to deny,” warns Watz in the singer’s own forceful style. As with each of the songs from Rise & Fall, the recording’s production mix is superior. Meanwhile, the accompanying video is funny while briefly taking a swipe at out-of-touch music industry types. By cut three from Rise & Fall, “You Want It All,” it’s easy to hear how the band has created a distinct sound. In the song’s music video, featuring green plastic toy army men, it looks as though Bunnell might be wielding a seven string axe, while Neufeld’s bass may be a five string. In any case, the music is dramatic, melodic and stinging. The same applies to “Life In The Fast Lane,” where Bunnell’s expertise and amplitude shines. For something a bit more syncopated, try “Desire and Yearning” or “Resistance.” “Where Do We Go” returns to more of a rock approach and “Jealously” is thick with distortion. But you will have to decide which songs help burnish April Art’s reputation as rockers.